Andrew Lloyd Webber’s sequel to The Phantom of the Opera received mixed reviews in London’s West End, and the planned Broadway production never came off. The West End production starred Ramin Karimloo and Sierra Boggess, and the currently available cast recording is from that production. This BluRay of Love Never Dies was shot in Australia, and features the cast of the Melbourne production, which was heavily revamped, and much more favorable received by the critics. The video features Ben Lewis as “Mr. Y” (the Phantom), Anna O’Byrne as Christine, Simon Gleeson as Raoul, Maria Mercedes as Madame Giry, Sharon Millerchip as Meg, and Jack Lyall as Christine’s 10-year-old son, Gustave. The adults are mostly popular Australian stage and television actors. O’Byrne was a principal artist with the Victorian Opera, and has since played Christine in the West End Phantom. Just my opinion, but with the Melbourne revisions, this may be the best thing Lloyd Webber has done since the original Phantom opened in 1986. I know some people who don’t care for this, but, to each his own. The Phantom is usually played by a tenor, for fairly obvious musical reasons. Lewis sings the tenor notes beautifully, but he’s clearly a baritone with a good high range (as are a substantial proportion of operatic tenors). 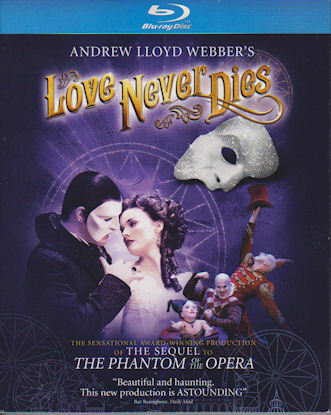 Love Never Dies’ Phantom is in many way a much more emotional part than in the original. He isn’t necessarily nicer, but he doesn’t run around indiscriminately killing people, either. Still, he does threaten to make Christine’s son disappear if she doesn’t sing for him in his music hall—at least until he realizes who the musically gifted boy’s father actually is. Likewise, O’Byrne, playing an older Christine, is more restrained, less giddy, than in the original show. She’s no longer the teenager moving from the ballet school into operatic stardom, but a seasoned professional in her mid twenties, perhaps a bit worn down by caring for a child and the burden of a handsome, but ultimately alcoholic and gambling addicted husband. And while we’re used to Christine as a lyric soprano—really, as a Broadway singer with the ability to carry pseudo-classical songs—O’Byrne’s voice is a darker, more mature, and far more powerful dramatic soprano. The way she sings the title song in the second act is a powerful reminder that she isn’t simply playing an opera singer, she actually is an opera singer, as well as a consummate singing actor. I don’t care how grumpy you are, just try to watch that sequence without reaching for the tissues. There are significant changes in this production from what was seen in London. The original prologue is gone, and the show now opens with the Phantom singing “Until I Hear You Sing Again.” This is a much better choice, as it involves the audience in the story immediately, and in a more intimate way, than the original prologue. Christine now comes to New York to sing for Oscar Hammerstein (grandfather of Oscar II) at his new Manhattan Opera House, and is diverted to Coney Island by the Phantom. In the West End production the Phantom tricked her into coming over. Now he merely hijacks her family as they get off the ship and then outbids Hammerstein. Not a huge difference, but very significant in delineating his character. Even such a minor change as moving the Phantom’s introduction to Gustave from the living room of Christine’s suite onto the balcony makes for a much stronger impact. Here and there The Phantom of the Opera is recalled in the music. O’Byrne’s look combines fascination and fear when a music box in her hotel suite begins playing “Angel of Music.” “Prima Donna” is heard as an underscore, though this time it is Christine who is being urged to sing, not Carlotta. This is, very seriously, one of the best videos of a stage musical I’ve ever seen, with production values frequently approaching those of a motion picture. Even the annoying little boom mikes hovering near the actor’s mouths are gone. It also contains some of the best music Andrew Lloyd Webber has ever written, performed by a brilliant cast. I only allow myself five stars, but this one might be worth a sixth.